This is a superb illustration from Fantasio magazine. 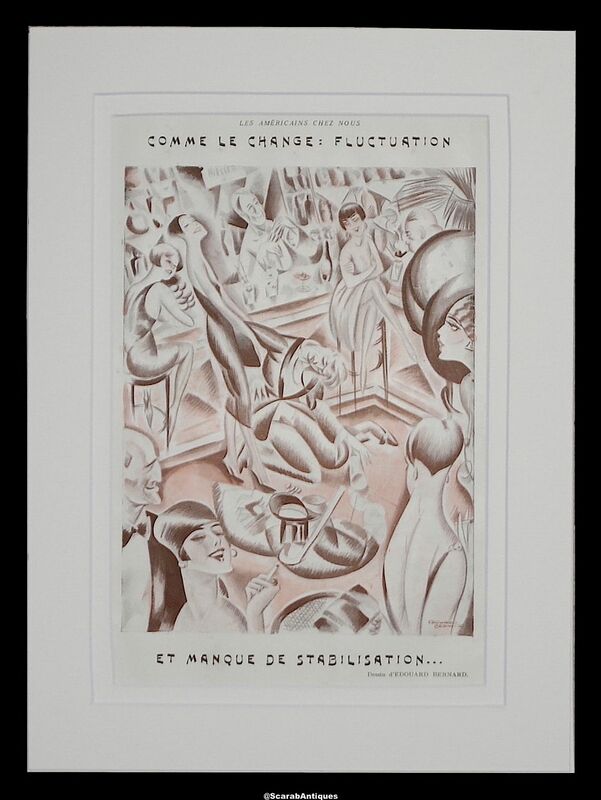 The illustration is by Eduoard Bernard and depicts a busy bar scene with clientele in 1920s fashion done in pinks creams & sepia. The captions are "Les Americans chez nous Comme le Change: Fluctuation et Manque de stabilisation". Presented in a double cream mount. Fantasio Magazine was a satirical bi-monthly publication founded by Félix Juven in 1907, which catered to the Bohemian social scene in Paris specialising in social commentary and political satire, and featured sometimes-risqué illustrations by a number of French artists, including Albert Guillaume, Metivet, Etienne Le Rallic, Fabiano, René Giffey and René Gontran Ranson. The cover of every issue was drawn by Auguste Roubille. Fantasio remained in print until the late 1920s.